Domaine De Fraisse Maison and Equestrian Centre is a very special, nature filled experience. Located only 8.5 miles from Carcassonne, France , Domaine de Fraisse covers 345 acres of fields and woodlands. What makes the Domaine so special is that the riding center is prepared especially to focus on working with children and young adults on the autistic spectrum. Fully aware of their visitors with special needs, the Restaurant La Centurée provides gluten free and vegetarian menu options. The combination of outdoor terrace dining and menu that features Domaine garden and locally grown products, assure restful, stress free family dining. Centered on horsemanship - ride, walk, talk, connect with the animals - as well as augmented by appropriate food options, the Domaine de Fraisse is a unique find. Physically active eco-adventure travelers, who seeks close contact with unique + natural environments very much appreciate Domaine de Fraisse experience. Outdoor pool, hiking trails and off road biking are just a few back to nature possibilities. Explore Domaine de Fraisse - a friendly welcome awaits you! Note - We are happy to announce Domaine de Fraisse has selected OneGlobe Network for online marketing. Ever wondered which website builder to use? 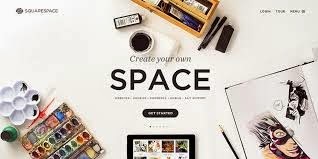 Ever heard about Squarespace?